The New Edition Story is a brilliantly produced three-night masterpiece that follows the careers of Ralph Tresvant, Michael Bivins, Ricky Bell, Bobby Brown, Ronnie Devoe, and Johnny Gill. This rags-to-fame biopic reveals the well-documented deadly sins of greed and pride within the music industry. 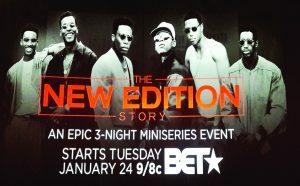 What has to be one of the most amazing productions made for television will be seen by millions over three nights on BET beginning January 24, 2017. The story starts in the projects of Roxbury, Massachusetts, where we find four young men who are hormonal and driven to help get their mothers out of the poverty. But what they soon learn is the harder they work, the harder it is to escape the realities of the music industry. The group was self-formed in the 1978 and managed by Brooke Payne, who at the start took the heat for the band’s not earning any money. After viewing the first night, if you are wondering whatever happened to him – he is among the list of the co-producers of the biopic. Expect to be amazed by the cast of celebrity icons, such as actress Monica Calhoun, who portrays a very convincing role as Ralph Tresvant’s mother, Patricia Tresvant. Alani Nicole “La La” Anthony plays the role of Flo DeVoe. Watching her in this movie proves that she is ready for a lead role in a non-hood drama. Other icons include Faizon Love, Yvette Nicole Brown, Michael Rapaport, Wood Harris, and Empire’s Bryshere Y. Gray, to name a few. The story begins with the “Littles” – the younger versions of the New Edition group Caleb McLaughlin, Myles Truitt, Jahi Di’Allo Winston, and Tyler Marcel Williams. It was Jahi Winston playing the role of Ralph Tresvant that will make a revelation during the movie that will change the way we look at and what we know about New Edition. His portrayal of Tresvant is one that will be talked about for generations to come. He had no voiceovers; the singing came naturally to him. He then makes the comparison that New Edition were five guys from the projects, and they bonded over music. He, along with the other three “Littles,” were four young men coming together to work on this movie and bonding to become life-long friends. Make no doubt that this musical docu-biopic should have been on the big screen. The song selections will have you dancing and bringing back memories of that 1980’s love interest. A film of this magnitude would need music producers of the same caliber. As the credits are going by on the screen, we find Grammy icons Kenny “Babyface” Edmonds and Antonio Dixon for Facetone Entertainment Group; James “Jimmy Jam” Harris and Terry Lewis for Flyte Tyme Production, Inc. as Music Producers. Not to mention that the movie is co-produced by all of the original members of New Edition, including Johnny Gill along with a host of award-winning producers such as Abdul Williams, who is best known for the Lottery Ticket. BET chose their top award winner, Chris Robinson, to round out the group with his background in both film and music videos. This mini-series will be a “je ne sais quoi” among African-American classics for many generations.